In an age where nearly everyone with a cellphone can consider themselves a photographer, Joseph Kraeutler and the Hasted Hunt Kraeutler Gallery in Chelsea net an array of classic photographers together in “Great Photographs of the 20th Century: Staged and Startled”. Recently, NYAB contributor Rena Silverman interviewed Kraeutler about the show, commercial viability, and the Kennedys. NYAB: Do you want to tell me a little bit about the show? Kraeutler: Basically it came together because we had been speaking with clients who had large collections and who were interested in selling bits and pieces and there was such a high quality of work. We were able to come up with an exhibition that really can include many of them, which are pretty hard-to-find images, many iconic and desirable. NYAB: Do you expect these images to sell? Kraeutler: Yeah, everything with the exception of one or two are for sale. Yeah, they’re being consigned for sale. NYAB: Is that normal for you guys? Kraeutler:I mean our general rotation is with our represented artists but every now and then when the opportunity comes we’ll do this. NYAB: You have a lot of recognizable images. Tell me about the theme of this show. can you talk about? Kraeutler: It’s a study of portraiture; kind of on the one end you have the Richard Avedons and the Irving Penns which are very much arranged ahead of time–studio lighting, hired models–and then everything from there to street photography which is really capturing a moment. It’s kind of that perfect moment at the right time, and kind of just the concept between what an artists does in preparation for each shot or no preparation. NYAB: Yes–her subject matter had a lot to do with it. Kraeutler: She got her start shooting family members. She was raised by a white family in a very wealthy town and this was a theme that she found very interesting–the way people dressed, their mannerisms, the children and the adults–which is where she got her start and after that she went and explored what was left of the aristocracy in Europe, which is where the work comes…. 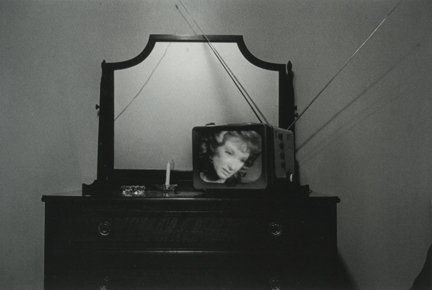 NYAB: How does [Tina Barney’s] point of view compare to somebody like Lee Friedlander’s? Kraeutler: [Friedlander’s] one constant is his play on line; this is one of the earliest works that’s in the show is an image of a woman in a television and that was him playing with the concept of an image within an image. And that is something that he played with in the 60s and since moved from but the one theme that has stayed constant throughout his career is playing with line. NYAB: and what do you think about Richard Avedon and all these people that sort of imitated him after? Kraeutler: He’ll [Avedon will] always be the first, and I think fashion photographers today who are successful are really trying to do what Avedon did. He set the base and then they came up with their own formula. I think every important fashion photographer living today will always reference these earlier techniques and make a point of not doing the same thing. NYAB: What about Stephen Klein, also a fashion photographer? Kraeutler: He [Klein] has a very different approach for fashion photography. And what I like about having his work in the show, it was a collaboration. I think it was called “domestic bliss” for W Magazine in 2005….What I liked about it, it was obviously staged and not based in reality….Both subjects are actors. He wanted to play with that suggestion of story without stills. 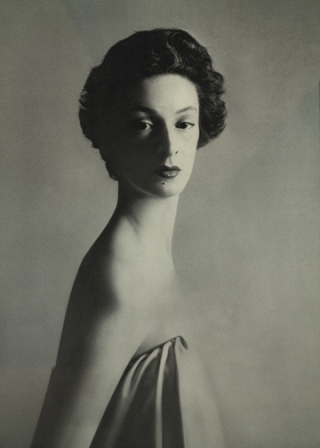 NYAB: About Irving Penn, do you think anyone will ever take his place at Vogue as the photographer? from what I understand he is irreplaceable there. Kraeutler: Yeah, it’s possible. Avedon, Penn, they’re legends; but at the same time quite different. NYAB: Can you describe each of their processes? Kraeutler: It’s a hard thing to comment on because so much changes with each shoot. I mean both are calculating perfectionists, you know, with every detail of lighting. NYAB: What do you think about someone like Ryan McGinley, [a portrait photographer] who is not in this show, but–? Kraeutler: It is certainly a unique route in photography and what sets it apart is how casual everything looks; almost the opposite of Irving Penn, where everything is a pristine and perfect. His [McGinley’s] work is more like snapshots, and it’s more about this young life that people are curious about. NYAB: I didn’t review that one [McGinley’s last show], it was a little too crowded to me. NYAB: Oh you know, I was going to ask you about Irving Penn’s corner thing? Do you know anything about that? Something where he put everyone in a corner and Georgia O’Keeffe got mad? Kraeutler: Right. I’m not sure, I’d have to do some research about how that came about. NYAB: Was that typical of him [Penn] to have a theme like the corner, and go with it? Kraeutler: well in a way that’s portrait photography. It’s something about having them [the subject] stand in a corner [where] there’s nothing other than the subject to kind of speak and having the same backdrop with different subjects forces the viewer to examine the subject more; rather than having various poses with various backgrounds. NYAB: Most galleries these days have a lot of color photography. I see that you have mostly black and white here. Of course iconic black and whites, like the Penns, but I wonder…. Kraeutler: Most of these are black and white. As soon as color was an option, artists kind of got involved very quickly. It was a way of doing photography in a new way and not repeating what had been done in the past. But these are mostly classics. NYAB: Do the classics sell more? Kraeutler: In general we sell color more. It almost becomes a different clientele. There are certainly collectors that do only black and white, if there’s a taste for that, whereas with color there’s a lot of that overlap with contemporary collectors or people who are just more excited by the process. Kraeutler: He [Frank] did experiment with color though, with polaroids. NYAB: So did Walker Evans. Looking at the prints here, can you always tell the camera? Kraeutler: you can kind of tell by the grain. Like this Stephen Klein phoograph is quite grainy. That’s a 35mm. But he wanted it to be like that, it suggests age and a story. It’s that 1950s set up that he was going after. NYAB: Do you anything about this guy? [pointing to William Eggleston’s Greenwood, Mississippi, (1972)]. This guy, the dentist? the nutty dentist? NYAB: How much does the publication affect how Avedon or Penn staged the photos? Kraeutler: It depends what it was being used for….Newspapers tended to stay away from darker images; they reproduce horribly. But, Speaking of gifts, this was actually the print that was gifted from Avedon to John Kennedy. NYAB: And, you have it! Kraeutler: There are two prints out there–this one and the one that he gifted to Jackie, but this one was signed by Avedon and Jackie. NYAB: So there’s definitely a POR on that. NYAB: What about Joel Sternfeld? What was the drive behind getting this famous image [McLean, Virginia, December 4th, (1978)] on your walls? Kraeutler: What I liked about that; it’s a rare print as a large dye tranfer. Also it’s, I liked how it appears that it were staged, when in fact it was more in the realm of street photography–the scene and what they’re doing is actually, the person who owned the house on fire purchased the house for development which never happened. 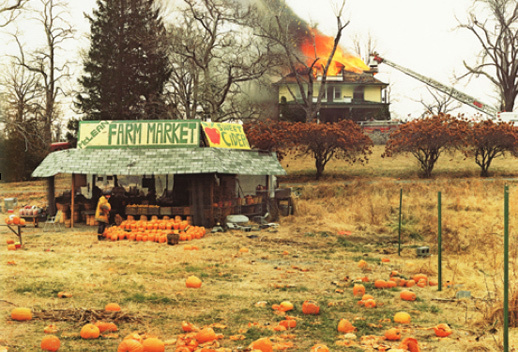 So he sold the house to the fire department to practice so that was actually an intentional fire, which is why the subject buying pumpkins in the front is so nonchalant. In a way I kind of wish I didn’t know the story, but it does kind of tell a little more. NYAB: People usually compare Tina Barney with Sally Mann because of subject matter, the sort of immediate family thing. Kraeutler: I understand why they would, I don’t think I would. They [Barney and Mann] are totally different animals to me. And something like with Sally’s work, she’s one of the few photographers still working in black and white. She is…very much about the technique…and…process. NYAB: Do you know the story behind this one [Lisette Model’s Fashion Show, Hotel Pierre, 1940-46]? Kraeutler: The title gives away as much as I know. I mean she [Model] was working in Paris for a long time and most of her work was [based around] commercial gigs and then from those she would pick some images to use as her Fine Art. Photography back then [1940s] was so expensive. Few were able to support themselves as fine art. NYAB: And to your point, the “Fine Art” aspect of photography was only beginning to emerge around that time. Kraeutler: It’s still sort of in its infancy. Even today the record for photography at auction is about two-and-a-half million, which is a lot, but compared to painting it’s not even close. NYAB: One thing I appreciate about your show, there’s nothing too colossal. I’m not feeling swallowed by a photograph. Kraeutler: And the space is more geared towards larger pieces. NYAB: Well, [larger pieces] do sell. Can you talk more about these photographers and their ‘commercial gigs’? NYAB: You have everything important! Kraeutler: We intended it to be something special, we wanted it to be something between a museum exhibition and a gallery exhibition. NYAB: So now what’s the future of photography? What’s going to happen to the industry in 100 years? Kraeutler: I feel like photography in a way–traditional photography–is ending. I certainly hope it doesn’t, but it seems to be the direction that it’s going. In a way it becomes a different medium. What’s going on in Kertesz’s head in the ‘20s and what’s going on in Cindy Sherman’s head now are two different things. NYAB: Does [Cindy Sherman] ever come out of her house? Kraeutler: Yes. She’s as sweet as can be. NYAB: I wonder about the archival aspects of photography, in the future. Kraeutler: New processes are being invented all the time and the only thing that can really test them is time. A lot of companies like Kodak or Fuji have guaranteed that the images will hold up for 100 years. NYAB: You have many editions of as little as two here; who has the negatives? Kraeutler: Most of these are known enough that if the photographer’s not with us anymore there’s an estate and we collaborate when necessary. The Kertesz in the show, the estate has never seen the negative and it’s thought that this could be unique and the only print that’s directly related to the age. Even with Eggleston some of this earliest images from the dye transfer, the negatives were in his glove box of the Cadillac that he sold and so they’re gone. NYAB: [With all the technology shifts]…photographers have almost been forced to constantly defend themselves against the amateur. Kraeutler: Photography is the most subtle of all mediums. Everyone can take a photograph at a very basic camera but the difference between a good photo and a bad photo is in the subtleties.